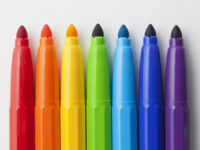 Crayola is working with schools across the country to keep dried-out markers from ending up in the trash can. Through ColorCycle, students in K-12 schools can collect used markers and send them to a recycling plant that will turn them into clean-burning fuel. This is NOT just for Crayola markers. They accept all brands of plastic markers, including dry erase markers and highlighters. It is easy to take part in this program. A teacher, parent, or adviser can sign up online. This program is FREE to the schools — Crayola pays all of the shipping charges. Once a school is signed up, it just needs a collection box or bin. When it is full, a teacher or sponsor packs up the markers and prints a shipping label. Everything you need to know to get started is on the website including a printable poster and a parent letter to send home with students. Encourage your local school to get started today! This is a great way to recycle used markers at the end of the school year. Or, start at the beginning of next school year. Learn more here.